Why don't you join this service? 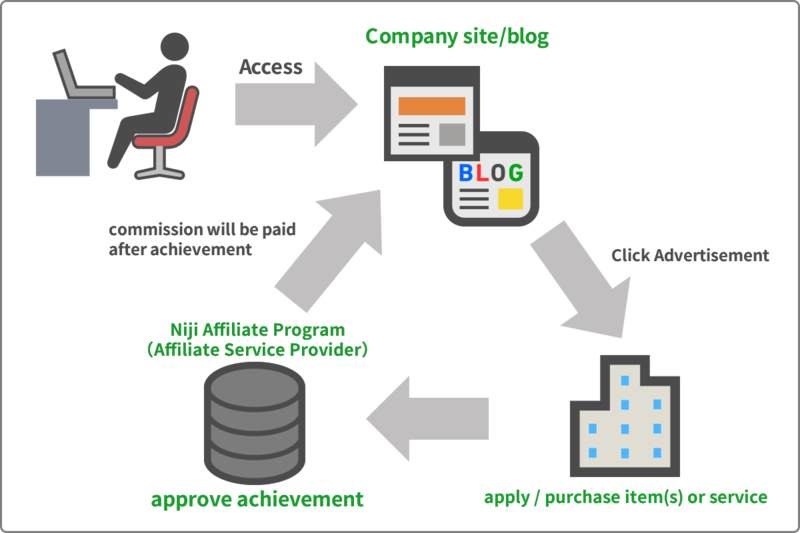 Join Niji Affiliate Partner and Get a new revenue stream. This program providers products you advertise. To advertise at your web site you just put a link on your site. An affiliate program is a great way to make money on the Web. You write the content that you typically write and then link to the products that you talked about. When one of your customers clicks on the link and buys the product, you get a small commision of the sale. Send necessary information from the application form and click the "Become a partner" button. Niji Affiliate program will confirm the contents of the application site and will inform you of the judgment result by e-mail, please wait for a while. When the judgment result arrives, click the link to decide your login password and log in to the management screen provided by Niji Affiliate Program and create an advertisements. Post your ad on your website or blog. If the site visitor clicks on the advertisement to purchase the item, we will pay the fee.